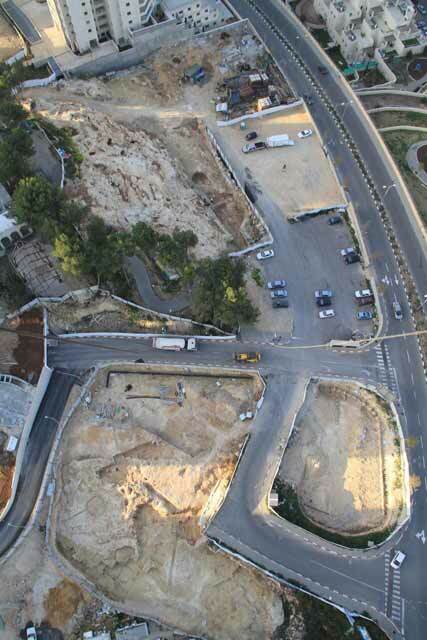 From November 2009 to May 2010, excavations were conducted in the Holyland Park compound in Jerusalem (Permit Nos. A-5776, A-5870; map ref. 217913–67/629284–370), prior to construction work. The excavations, undertaken on behalf of the Israel Antiquities Authority and financed by Holyland Park Ltd., were directed by I. Milevski and U. 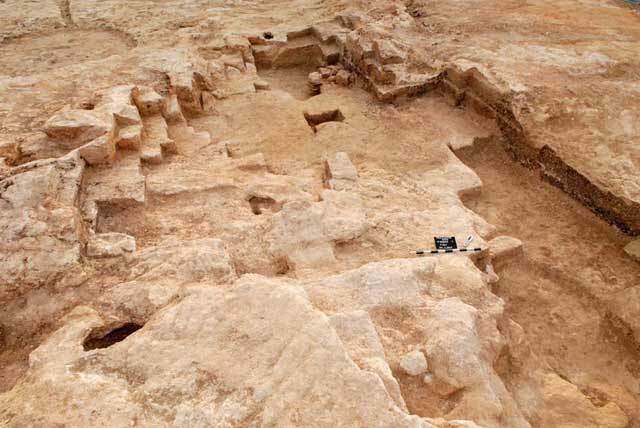 ‘Ad, with the assistance of N. Agha (area supervision), Y. Ohayon and R. Abu-Halaf (administration), C. Masarwa and S. Gendler (trial trenches), A. Hajian, T. Kornfeld and M. Kunin (surveying and drafting), A. Peretz (photography), Sky View (aerial photography), D. Levi (GPS), S. Ilani (geology), P. Gendelman and E.J. Stern (pottery reading), M. Shuiskaya (pottery drawing), O. Barzilai (flint artifacts) and A. Eirikh-Rose. Two areas, northern and southern (5,000 sq m; Fig. 1–6), were opened up on a hill overlooking ‘Emeq Refa’im from the north. 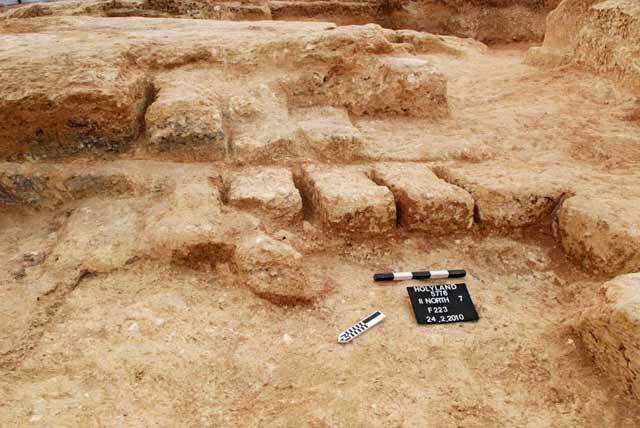 They were found to contain a Chalcolithic underground dwelling complex; quarries and rock-cuttings dating mostly from the Early Roman period; a winepress and cupmark of unknown date; a building from the Ottoman and British Mandate periods; as well as a cave and a water cistern. The bedrock at the site is of the lower Kefar Sha’ul Formation and is composed of two layers: an upper layer of hard limestone nari and a lower layer of marl and soft chalk. 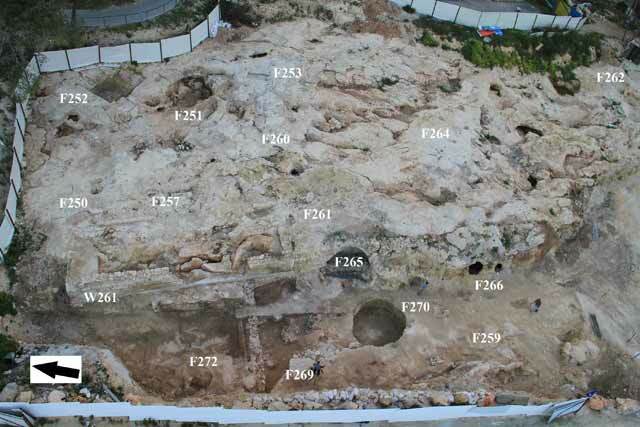 Previous excavations at the site revealed a burial site from the Intermediate and Middle Bronze Ages and installations and remains of the Arab village of Malha, which stood there until 1948 (Ben-Arieh 2000; Zelinger 2004; Milevski and Ben-Or 2007; Milevski et al. 2007; Milevski, Greenhut and Agha 2010; Greenhut et al. 2011). No burials from the Intermediate and Middle Bronze Ages were discovered in the current excavation, suggesting that the boundary of the burial site from these periods ran along the southern perimeter of the hill. The dwelling complex, whose roof had collapsed, was unearthed in the northwest part of the southern area. It yielded hearths and abundant potsherds, flint items, stone tools and animal bones. A bell-shaped pit found near the complex (F270; Fig. 5: Section 5–5) contained intact pottery ascribed to the Ghassulian culture, including a bowl, jars and churns, as well as flint tools that included sickle blades and bifacial tools (Milevski et al. 2015). 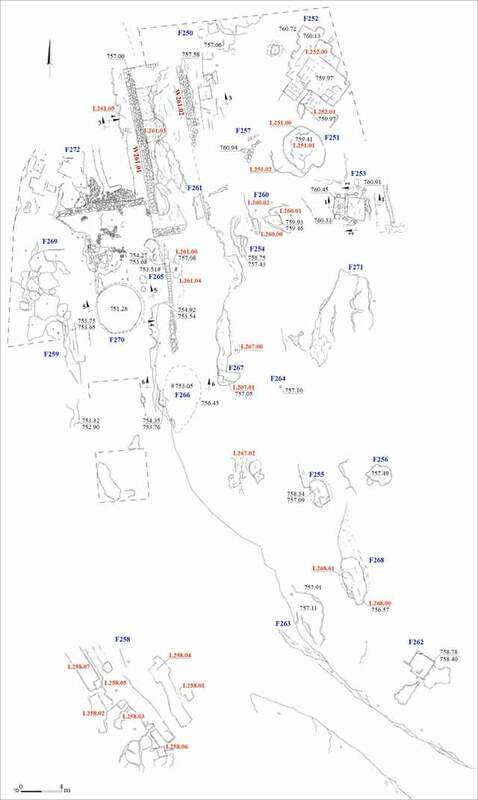 Sixteen quarries and rock-cuttings were discovered (Table 1), nine in the northern area (F220–F224, F226–F229) and seven in the southern area (F250, F252, F258–F260, F262, F272); most are of the courtyard and stepped quarry type (Safrai and Sasson 2001:4–7). Most of the quarries could be discerned prior to the excavation, and their bedrock floor was exposed; some contained an accumulated layer of modern soil. All of the upper quarrying steps were hewn into the nari bedrock, whereas some of the lower steps were hewn in the nari bedrock and some in the soft chalk or marl. A uniform technique for extracting the stones was used in all the quarries: separation channels (3–9 cm wide) were hewn around the stones, which were then extracted with severance channels (0.08–0.12 m wide), sometimes with the aid of an iron quarrying bar (crowbar) or a long chisel (Fink 2000:631–635). The dimensions of the undetached stones, the distances between the severance channels and the dimensions of the quarrying steps show that stone slabs and masonry blocks were extracted from the quarries. The stone slabs (0.05–0.15 m thick) were used for paving and lining walls, and their working marks were identified in Quarries F220, F227, F250 and F252. The masonry blocks came in a variety of sizes (0.20–0.35 × 0.40–0.50 × 0.60–0.80 m). The quarrying debris discovered in the quarries shows that once they were detached, the stones were dressed at the site. Marl was also extracted to manufacture mortar and lime in the Early Roman period (Gadermayr, Pintér and Weber, forthcoming). A few potsherds, including Iron Age bowls (Fig. 9:1, 2) and an Early Roman cooking pot (Fig. 9:3) and jug (Fig. 4:9) were recovered from the quarrying debris at the bottom of Quarries F222–F224. The pottery indicates that the quarries were used mainly in the Early Roman period. Quarry F220 (Fig. 2). Only the north part of this small quarry was uncovered; its eastern part was destroyed in modern times. Quarry F221 (Figs. 2, 10) is large, and its eastern side is deep. Some of the quarry walls are vertical and others are stepped with slanting severance channels. Two layers of light-colored quarrying debris separated by an accumulation of brown soil were unearthed at the bottom of the quarry. A few clusters of stones (Fig. 11) that had apparently shattered while being quarried were identified. Circular pits, probably natural, were discovered on the bedrock surface around the quarry. Quarry F223 (Fig. 2) is a deep, medium-sized rectangular courtyard quarry; its northeastern part is shallower. On the north, the quarry is connected to Quarries F226 and F228, and the three are probably part of a single quarry. Except for its stepped southern wall, the quarry’s walls are vertical, suggesting that the quarry was fully exploited. Light-colored quarrying debris and a few medium-sized broken stones remained on the quarry’s floor. Quarry F224 (Figs. 2, 12) is a large stepped quarry, irregular in shape. It is terraced throughout and extends to the northeast, beyond the excavation perimeters. The bedrock to the north of the quarry sloped steeply, possibly due to a streambed the cut through the rock. The northern part of the quarry was worked to a greater depth; its middle steps were quarried into soft limestone rock, and its bottom steps — into marl. Quarrying debris and a few broken stones had accumulated at the bottom of the quarry, mainly in its northern part. Quarry F226 (Fig. 2) is an irregularly formed, medium-sized courtyard quarry. On the south, the quarry is connected to Quarries F223 and F227, and together with Quarry F228, which connects with Quarry F223, seem to be all part of a single quarry. Most of the quarry walls are stepped, except for a few vertical walls spanning the height of two or three steps. Within the quarry was an accumulation of quarrying debris with a few medium-sized broken stones. Quarry F227 (Fig. 2). Most of its walls are stepped, and it is connected to Quarry F226 in the north. The quarry extends eastward, beyond the excavation area, and only its western part was excavated. It contained an accumulation of quarrying debris with a few medium-sized broken stones. Quarry F228 (Fig. 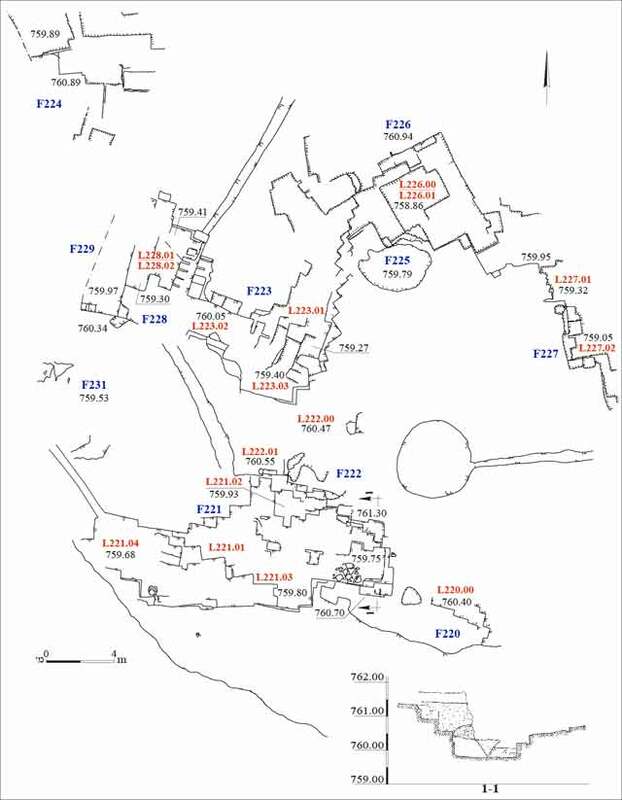 2) is a medium-sized, quadrangular courtyard quarry connected to Quarry F223. The quarry extends westward, beyond the excavation area, and its northeastern corner was damaged by a modern trench. Most of the quarry walls are stepped, apart from a few vertical ones in the west, which are three–four steps high. Undetached stones were uncovered in the two lower quarrying steps (Fig. 13). Quarrying debris had accumulated at the bottom of the quarry. Quarry F229 (Fig. 2) is a corner of this quarry, which extended westward, beyond the excavation area. It contained an accumulated mixture of light-colored quarrying debris and brown soil. The location of the quarry and the direction of the quarrying indicate that it may be the southern part of Quarry F224, which extends to its north. Quarry F250 (Fig. 4) is a medium-sized stepped quarry that extends northward, beyond the excavation area. Quarry F252 (Fig. 4) is a medium-sized courtyard quarry near the top of the hill’s western slope. A small amount of quarrying debris was found in its southern part. Traces of another quarry were found to its north. Quarry F258 (Fig. 4) is a large, shallow quarry in the lower part of the hill’s western slope. It has seven separate quarrying areas in the nari rock; several are small and shallow. Signs of a quarrying channel are evident on the quarry floor. Within the quarry was an accumulation of light-colored quarrying debris; its upper part was mixed with modern finds. Quarry F259 (Fig. 4) is a small part of a stepped quarry that extended eastward beyond the excavation area. Quarry F260 (Fig. 4) is a small, quadrangular rock-cutting (0.77 × 1.00 m, max. depth 0.23 m) with a small cupmark (L260.01; diam. 0.15 m, depth 0.13 m) in its north wall. Another small cupmark (L260.02; diam. 0.14 m, depth 6 cm) was unearthed c. 1 m farther north. Quarry F262 (Fig. 4) is a small quadrangular courtyard quarry on the upper part of the hill’s western slope. Signs of quarrying a severance channel can be discerned on the floor and walls of the quarry. A quarrying step was discovered farther up the slope, c. 2 m to the northeast. Quarry F272 (Fig. 4) is a small stepped quarry. Uncovered on its floor are severance channels and an undetached stone block. Winepress F253 (Figs. 4; 5: Sections 1–1, 2–2; 14), hewn in the nari rock, is simple, comprising a square treading floor (2.0 × 2.2 m, depth 0.15 m) connected on its west via a channel to a rectangular collecting vat (1.0 × 1.7 m, depth 0.3 m) with a sump (diam. 0.25 m, depth 0.12 m) hewn in its center. The winepress is located on a westward slope, allowing the must to flow down the natural slope from the treading floor to the collecting vat. Four cupmarks (diam. c. 0.25 m, depth 0.15 m) uncovered around the treading floor were linked to it and to the collecting pit via narrow channels; they may have served to add liquids, or some dissolved substance, while preparing the must. No diagnostic finds were recovered from the winepress. Cupmark F264 (Fig. 4) is circular (depth 0.11 m) and hewn in the middle of the hill’s western slope. Its upper part (diam. 0.13) is wider than its lower part. Building F261 (Figs. 4; 5: Section 3–3) is a large rectangular building from the Ottoman and British Mandate periods. 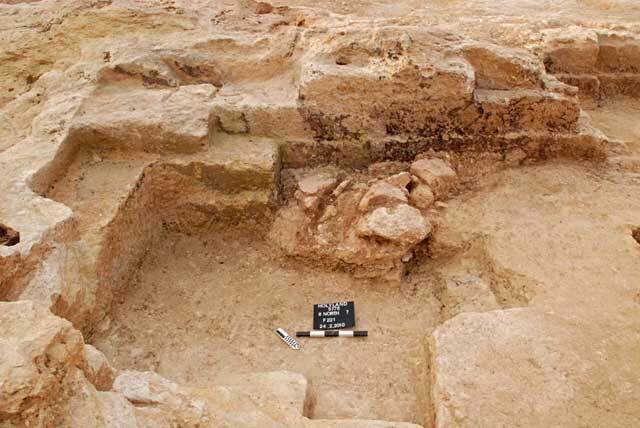 It was probably linked to the village of Malha, c. 1 km to the southwest. Traces of a tamped-earth and plaster floor were discovered inside the building. A wall (F257) that may have been part of the building was uncovered to its east. The western part of the building was constructed over the dwelling complex from the Chalcolithic period (F269). Cave F265 (Fig. 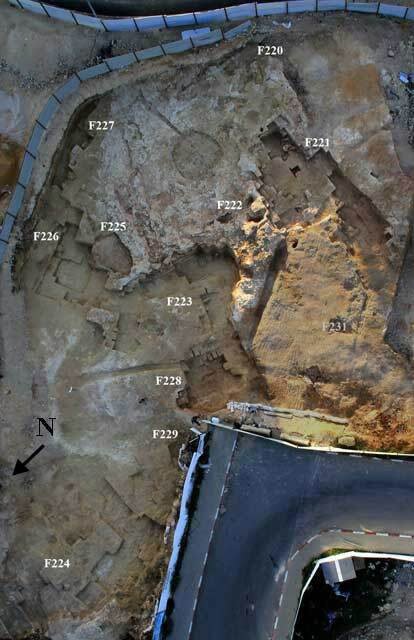 4) was exposed beneath the southern part of Building F261. It was probably used as a storehouse or an animal pen when the building was in use. 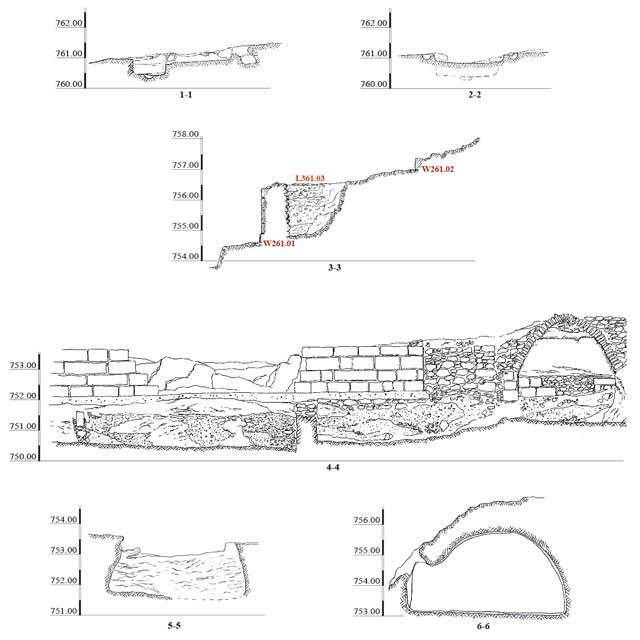 In recent times, an arch was built around the cave entrance, along with a wall that connected it with one of the walls of the building (L261.05; see Fig. 5: Section 4–4). 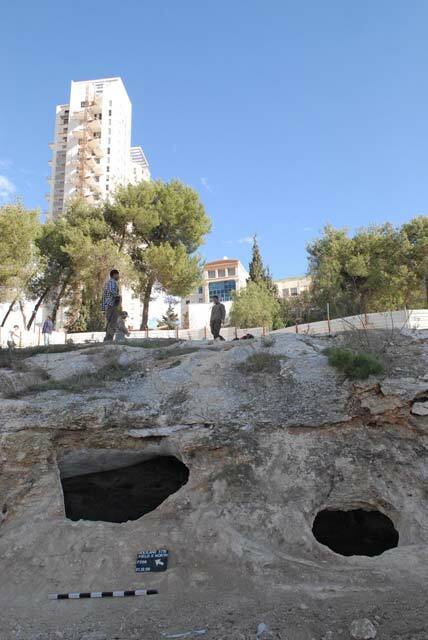 The cave was not explored due to a directive from the Ministry of Religious Affairs. Cistern F266 (Figs. 4; Fig. 5: Section 6–6; 15) is elliptical (c. 4 × 7 m) and plastered. It contained alluvial soil and modern debris. 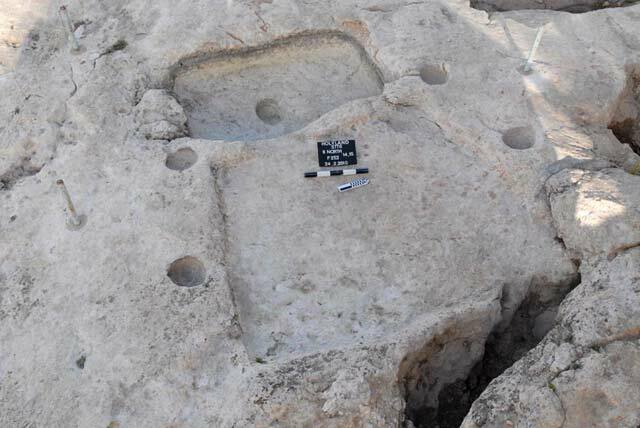 The water cistern, which was not excavated, may have been used by the occupants of the nearby building (F261). Natural pits. Nine natural pits were discovered: F225 (in the northern area), F251, F254–F256, F263, F267, F268 and F271. Greenhut Z., Milevski I., Agha N. and ‘Ad U. 2011. 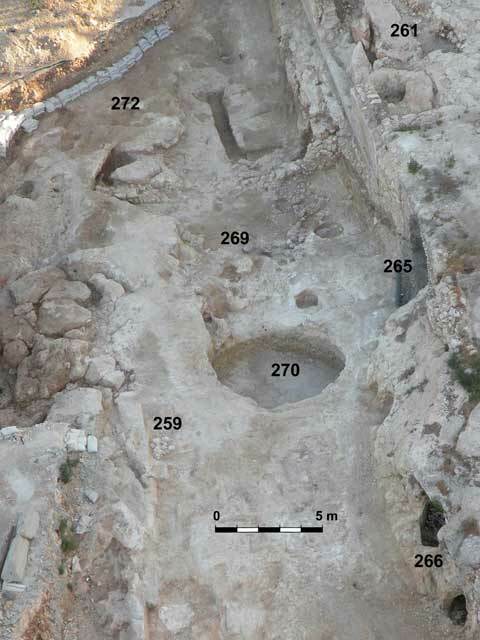 Chalcolithic Period Remains and a Bronze Age Graveyard Found at the Holyland Complex, Jerusalem. Qadmoniot 141:21–28 (Hebrew). Milevski I. and Ben-Or K. 2007. Jerusalem, Holyland Park. HA-ESI 119. Milevski I., Greenhut Z., Agha N., Nagar Y. and Kolska-Horwitz L. 2007. 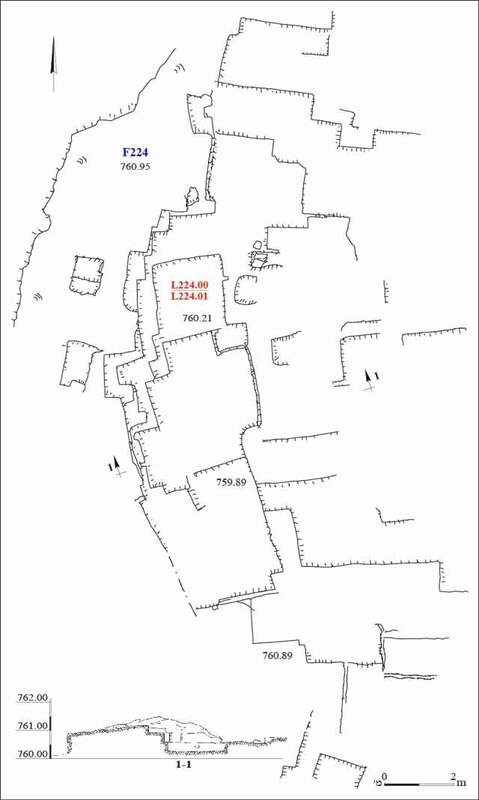 An Intermediate Bronze and Middle Bronze Age Cemetery at Bayit VeGan. In J. Patrich and D. Amit eds. New Studies in the Archaeology of Jerusalem and Its Region: Collected Papers 1. Jerusalem. Pp. 140–141 (Hebrew). Zelinger Y. 2004. Jerusalem, Holyland. HA-ESI 116. 1. Excavation areas, aerial view looking south. 2. North area, plan and section. 3. North area, aerial view looking southeast. 6. South area, aerial view looking east. 7. 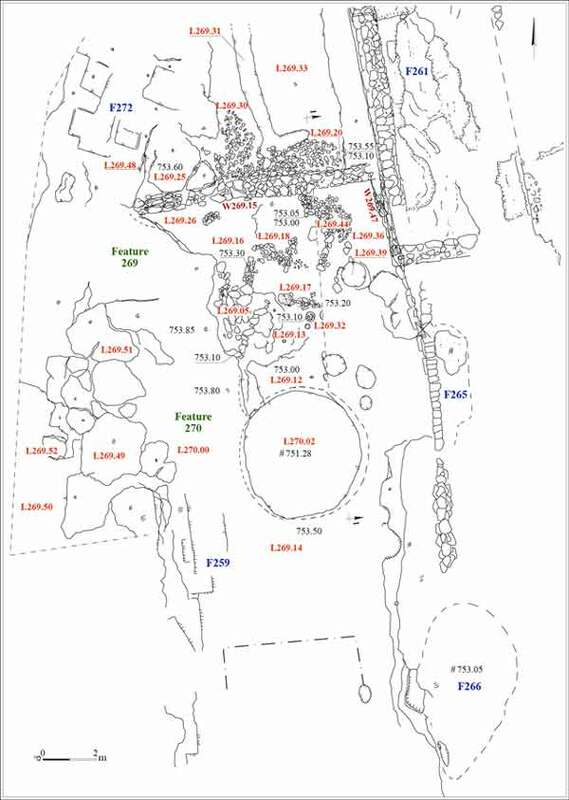 Chalcolithic dwelling complex, plan and section. 8. Chalcolithic dwelling complex, looking north. 10. Quarry F221, looking east. 11. Stone cluster in Quarry F221, looking southwest. 12. Quarry F224, plan and section. 13. Undetached stones in Quarry F228, looking southeast. 14. Winepress F253, looking west. 15. Entrances to Cistern F266, looking east.